>> KEY TAKEAWAY: University of Richmond Robins School of Business, Virginia Council of CEOs survey remains positive, sales likely to increase. Each quarter the Virginia Council of CEOs (VACEOs) and University of Richmond’s Robins School of Business partner to take the pulse of top executives in the region. The survey results provide a snap shot of the overall economic outlook index for various companies within the region and help central Virginia companies anticipate business decisions and plan for growth. 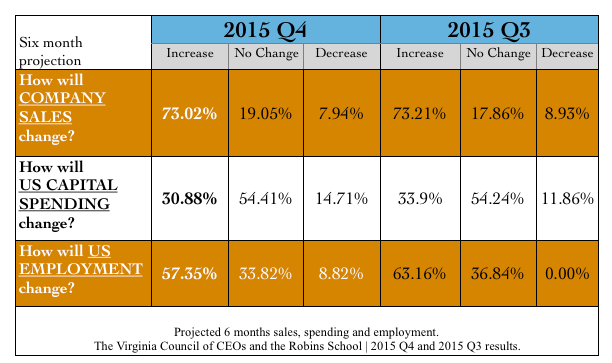 The results for the fourth quarter 2015 CEO Economic Outlook survey by the University of Richmond’s Robins School of Business and the Virginia Council of CEOs continues to show optimism among chief executives in central Virginia with 73 percent of respondents expecting sales to increase over the next six months. Approximately a third of respondents expect capital spending to increase. The survey’s index, which measures executives’ views on projected hiring, capital spending and sales, fell sharply from its third quarter level, which was the highest ever recorded, to its lowest level since the second quarter of 2014. The survey has been administered quarterly for more than five years. 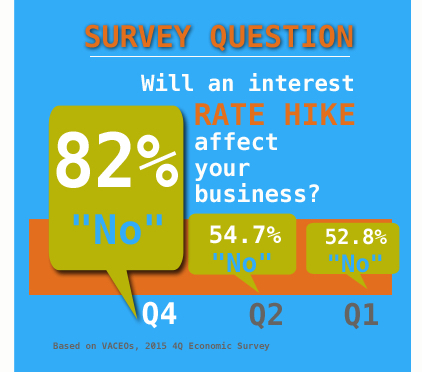 The 2015 fourth quarter survey also asked CEOs to indicate how the Fed’s decision to raise interest rates would affect their business in the next six months. Eighty-two percent report that they expect no impact. This number has risen significantly compared to the 54.7 percent in Q2 and 52.8 in Q1 of 2015 who expected no impact. Seven percent believe it will increase profits. This number represents a slight increase from prior surveys, where 3.8 percent of Q2 respondents and 1.9 percent of Q1 respondents expected a favorable impact. Currently only 10 percent believe it will decrease profits. This number has drastically decreased compared to Q2, where 41.5 percent, and Q1, where 45.3 percent of CEOs believed it would decrease profits. The Virginia Council of CEOs is a nonprofit organization whose mission is to connect the CEOs of second-stage companies. The Council is led by a board of directors, which is comprised of 18 members and the executive director. Currently, there are 126 CEO members. For responding CEOs on this survey, the average member company had roughly $9.5 million in revenue for the most recent 12-month period. Multiple industries are represented in the sample, including construction, manufacturing, finance & insurance and retail. The average employment of member companies for this survey was 42. The council continues to expand the survey beyond its members, offering any area business owners whose companies gross at least $1 million in annual revenue the opportunity to participate. If enough businesses participate, the council will provide survey results by industry. Participation is free, and all participants will receive copies of the survey data. Business owners and CEOs who would like to participate in the next survey should contact Scot McRoberts.